When some of the world’s most respected philosophy historians fill a room to discuss concepts such as evil, pride, body and space, the discussion can get pretty lively. 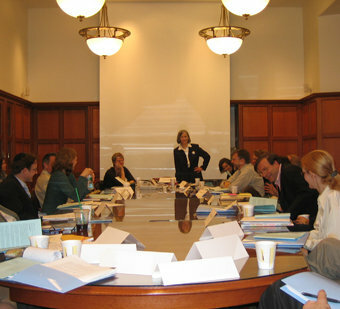 In that vein, more than two dozen academics from the College and around the world gathered on April 24 in the Witten Center for the Core Curriculum in Hamilton Hall to begin work on an ambitious series of texts, Oxford Philosophical Texts, edited by Christia Mercer, the Gustave M. Berne Professor in the Core Curriculum. Those in attendance spent April 24–25 brainstorming how to take the overarching concepts of life and put them into books. Some will be writing and editing these books, but others from the College came from a variety of disciplines — music, history, literature — to add their thoughts. The results will start coming out in a couple of years with the publication of the first six to eight of what will eventually be about 15 books. Oxford University Press initially approached Mercer and asked her to write an encyclopedia of philosophy. Feeling that the market for such books was already saturated, she came back to the editors with the idea to publish a collection of works, each focusing on a different concept. The books aim to capture “the major events in the life of a concept,” Mercer said. What makes these books unique is that they will involve an international collection of authors and editors. In addition, they will offer “Side Notes,” an idea that came out of the gathering at Columbia. The Side Notes will be a brief, illustrated insert to each volume, written by someone outside philosophy to add a unique perspective to how the concept has been portrayed throughout history. Upon publication, Oxford plans to aggressively publicize the series with an international advertising campaign. The series will be geared toward students at an upper level undergraduate level and higher. “They’re not going to be books you’re going to find in the airport, though the one on evil might be there,” Mercer joked.